I initially planned to go to the Post Office today as I received a notice earlier informing me that I have a parcel available for pick up. I was hoping it was the toy guitar I got for free from an online site in exchange for an honest review on my little man’s blog and cannot wait to get it. Now, it might not be like this amazing polytune mini at musicians friend, but I am sure Jared will have a wonderful time playing with it, plus he does not have a guitar toy yet. It was almost past 5pm when I finally managed to go out as I have finished all the chores lined up for that day before preparing to leave. The little man even insisted I tagged him along, so I obliged, delaying me a few more precious minutes, since I need to get him ready to leave, too. In the end, we did not make it to the Post Office, but went instead to buy milk and a few staples from the grocers. We also dropped by the local fair happening near the Provincial Capitol. I bought a few delicious treats from them last week when we drop by and I was hoping I could get a few more today. Turns out the California Maki is no longer available. Such a disappointment! Good thing I still managed to get a few pieces of these delicious okoy. 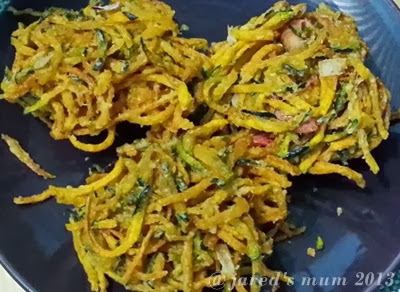 The seller created a healthy twist with this native delicacy, they used nutritious and delicious squash to make these crunchy treats , and threw in a couple of greens, too! I instantly loved it and will definitely go back to buy a few more. My sister and I had the okoy for dinner and we had quite a quick yet satisfying meal! Burp! This entry was posted in food musings and tagged Filipino street foods on 4.December.2013 by admin.